Regent University’s School of Education supports public and private school educators and administrators across a spectrum of educational specialties. From initial licensure programs in areas such as elementary education, special education and secondary education to programs that provide currently licensed teachers the ability to add-on endorsements such as Administration & Supervision, Gifted Education, English as a Second Language, Reading Specialist and Mathematics Specialist, we offer in-demand programs that will equip you with the highest skill set while incorporating a biblical foundation that will make your efforts even more fruitful and long-lasting. Students in Regent’s School of Education come from diverse backgrounds, nationalities and denominational traditions, but what they all share is a love for education and a desire to make a difference in the lives of their students and colleagues. Pursuing a Regent degree will help you prepare for your calling and career. Let’s get started today! Regent’s foundation is more than a date carved on a cornerstone. It’s a perspective that’s imprinted on every program, class and relationship you’ll experience. 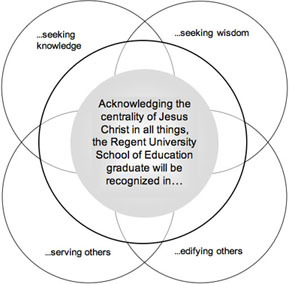 Our School of Education programs will deepen your understanding of both the power of knowledge and the spiritual truths that give it value and meaning in a curriculum that balances timeless Judeo-Christian principles with the highest standards of contemporary theory and practice. Seek knowledge by formulating questions and answers to current educational issues and by formulating research-based solutions. Seek wisdom by applying the knowledge in a manner that demonstrates a God-given wisdom to create an environment in which justice, human dignity and academic achievement are valued. Serve others by treating others with dignity, love and respect, as well as supporting and encouraging others. Edify others by demonstrating awareness of and sensitivity to the individual needs of students, colleagues and community by growing in competence and character. Thus we seek to prepare competent, caring and qualified graduates who will become Christian leaders that transform education through their example. When you graduate from Regent, you will hold more than an advanced degree in education. You will hold the knowledge and leadership skills you need for professional and personal success. The School of Education, through its commitment to excellence in teaching, research and service, provides a biblically based, Christian education to equip men and women in mind, heart and character for lives of educational and transformational leadership. The Regent University School of Education, affirming the University vision, mission, and values and acknowledging its call to be a distinctive school of graduate education, commits itself to innovative and excellent academic programs; to unique and exemplary program delivery both on campus and at a distance; to depth and breadth of faculty teaching, research and service; and to preparation and empowerment of graduates who actively embrace the challenge of transforming education through practice and example. We pledge ourselves to transforming education worldwide by promoting biblically compatible, research-based solutions to challenges in education through bridging theory and practice, and by building effective partnerships with schools and community agencies. We are committed to building and maintaining an outstanding faculty and a diverse student body consistent with the mission of the university. How should I decide which graduate degree to pursue? What do you want your degree to do for you? Do you want initial licensure that will allow you to go into the classroom as a new public school teacher? Are you a current public school educator looking to add an endorsement to your teaching license? Are you looking to become a college professor? Do you have a master’s degree and want to pursue your specialist or doctoral degree? Please review our available graduate programs and their associated career opportunities to determine which degree is most appropriate for your goals. Feel free to contact us at 888.713.1595 or edadmissions@regent.edu with questions. Once you have decided which program to study, view the admissions process to determine if you are eligible to apply and review admissions requirements. You can use this link to apply online too. Can I use financial aid (scholarships, grants or loans) for this degree? If you are applying to a degree-seeking program at either the master’s or post-master’s level and you plan to take at least six credit hours in the fall or spring semesters and at least three credit hours in the summer semester, you are eligible to apply for federal financial aid. You may begin the process by filling out your Free Application for Federal Student Aid (FAFSA). We also recommend that you review our school-based scholarship and grant opportunities. The professors at Regent are regionally and nationally recognized leaders in education. They have terminal degrees in the field, practical experience in their subject area and truly care about your personal and spiritual growth. Learn more about our experienced faculty. We have students of all ages and from all walks of life, from those who have recently completed their undergraduate degrees to seasoned teachers who are ready to go back to school to remain current and competitive in today’s classroom. In addition, we have students with extensive career experience outside the field of education who are now ready to pursue a teaching degree in order to transition into the field of education. The average age of our students is 32, and 76 percent of our current students are studying on a part-time basis while they hold full-time jobs. Our students truly represent diversity in every sense of the word! Read our SOE’s Regent Life section (News | Research & Dissertations) to learn more about our current students and alumni. What is master’s level work like? What is doctoral work like? Master’s Level: The School of Education’s master’s programs focus on meeting the demands for a globally competent graduate. Typically three to four hours a week per credit hour is required for readings, research, completing assignments or other tasks such as discussion boards in an online course. The key to success is to review the syllabi in detail, know course expectations, stay up-to-date with coursework and maintain contact with your professors should problems arise. Doctoral Level: The School of Education’s doctoral studies focus on research, writing and data analysis. Students have the opportunity to investigate and research an area of interest that will contribute to the field of study within the concentration they select. One can expect to read and write in a scholarly manner, conduct research, analyze data and defend the study. Time spent on coursework is estimated at around 15 to 20 hours per week on average. The program is rigorous and prepares students for advanced leadership positions while at the same time allows the student to independently investigate an area of interest. Once you have submitted an application and application fee and it has been processed in our system, you will be assigned to an admissions counselor who will serve as your primary point of contact for everything having to do with your application and supporting documents. He or she will remain your point of contact until you receive an admissions decision. When your application and all supporting documents for your program have been received, you may be contacted for an interview. Within five business days of receiving a complete application (including your interview, if required), we will notify you of your admissions decision. Note: If you do not pay your application fee, we will be unable to process your application. Will the School of Education accept any credits from another school? The School of Education does accept transfer credit. View our transfer policy. What can I expect from my doctoral residency? Regent mirrors the historical tradition of the applied doctoral degree by using intensive residencies. In view of this goal, waiving residency requirements is not an option. Master’s Applicants: If you are applying to a master’s program, the answer is NO. Many of our programs do require other exams for admission (i.e., Praxis, MAT or VCLA), but the GRE is not a requirement for any master’s degree. Specialist Applicants: If you are applying to the Educational Specialist (Ed.S. ), the answer is NO. Doctoral Applicants: If you are applying to an Ed.D. or Ph.D. program, the answer is YES. This is a firm requirement, and we are not able to waive it for any application. Scores must be current (within the last five years). If you have further questions about this, you can contact your admissions counselor by calling 888.713.1595. What if I am/was in the military or my spouse is/was in the military? What will my benefits look like? We are highly dedicated to being a military-friendly university. We have several options for ways to use your military benefits. Please visit our Office of Military & Veterans Affairs page to learn more. YES. Regent University is accredited by the Southern Association of Colleges and Schools Commission on Colleges to award associate, baccalaureate, masters, and doctorate degrees. Contact the Southern Association of Colleges and Schools Commission on Colleges at 1866 Southern Lane, Decatur, Georgia 30033-4097 or call 404-679-4500 for questions about the accreditation of Regent University. In addition, our teacher education and endorsement programs are accredited by the Teacher Education Accreditation Council (TEAC), which is one of two national accreditation agencies for the field of education. TEAC accreditation demonstrates that we work closely with the Virginia Department of Education (VDOE) to make sure our VDOE-approved programs are in line with best practices to help our students become highly qualified educators once they have completed their program. We are also Association of Christian Schools International (ACSI) accredited. All applicants are required to submit a timed writing sample for review. This sample is administered through the ETS Criterion Service and is used to technically grade your writing ability (assessing flow, grammar and style). Applicants select one of the three offered topics and write 400 words on the topic in the provided 40 minutes. Please do not wait until the last minute to complete this sample. It is an important part of the application process. Note: If you are applying to the Ed.S., Ed.D. or Ph.D. programs, you will submit an additional writing sample known as an Educational/Professional Paper. What if I just need one or two classes and not a whole degree? We offer nondegree-seeking courses for credit at a discounted tuition rate. If you are looking for a course or two to help keep your teaching license current or to test a course before committing to a full program, our professional development courses may be just what you need. Note: These courses are not eligible for federal aid. Professional Development courses not available for all programs of study. Email us at edadmissions@regent.edu or call us at 888.713.1595 to speak with an admissions counselor.